If you’re anything like we are, you have always dreamed of having an English nanny to take care of you. The games you’d play and the fun you’d find in every job that must be done. The super long words you’d get to learn. The birds you’d get to feed. You’d sing the day away and meet such wonderful, magical friends. And the uniform! You’d get to see that iconic uniform up close and personal, every single day. (Sigh…) Now that we’re all grown up, we know that dream has run out of time for us. But – BUT – it could happen to your little girl, and just in time for Halloween! 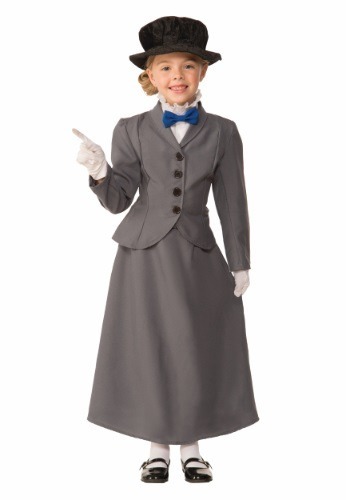 This Child English Nanny Costume lets your child dress up for the part and play the role of caretaker of you and your home and all the children on Halloween. Once she puts on the English nanny uniform – complete with a cute hat and bow tie – she’ll be ready for the job (and ready to melt the hearts of the adults handing out trick or treat candy)! The costume is made of polyester poplin fabric for a crisp, freshly pressed look. The tailored jacket buttons properly up the front and is nipped in at the waist like all nanny uniforms are. The skirt has elastic waistband for easy and comfortable fitting (especially after eating all that candy!). The shirt front fastens around the neck with Velcro, and the snappy bow tie is securely attached to the front. And the hat is the perfect finishing touch. It’s felt-backed, black velour to top off the nanny look and make sure your girl is in control of the party!